Rebecca has been a member of the MMS community since 2001 when she enrolled her oldest son, Bryce, in the Nest. She has been the directress of Lower Elementary East since 2004, one of our two lower elementary classrooms. Rebecca is certified by the State of Michigan in elementary education, language arts and biology. She received her Montessori certification at MMTEC in Rochester Hills, Michigan. 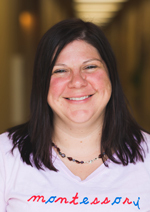 Rebecca earned her Masters of Arts degree in Education from St. Catherine University and completed her undergraduate degree at Siena Heights University. Rebecca Loope can be reached at rebeccaloope@meadowmontessori.org.